Lance is a Johnson City native with a work history and versatility that makes him a valued addition to UDC. Brining a familiarity with a variety of maintenance issues and solutions to the team, Lance has become an indispensable member of our staff. He has worked for several local companies in a range of functions and roles before joining UDC. His 11 years of knowledge and training in the maintenance field mean you can be assured when Lance does the job he will have it done quickly and correctly. In early 2018, Lance completed an extensive training course from the National Apartment Association and is now a Certified Apartment Maintenance Technician. 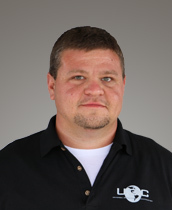 In 2019, Lance moved into a new role as Storage & Warehouse Manager for Universal Storage Solutions, a storage solutions provider managed by UDC.